Home DIY Projects	Best Gold Spray Paint EVER. So, today I spray painted my garden frog. He is made of solid concrete and is VERY heavy. His green paint was chipping off and I decided to glam him up a bit with some metallic gold spray paint. So, he got a little bath and a scrub. Poor guy. He is in sad shape but Pennsylvania winters are tough on everyone. After he dried I sprayed on a coat of the gold metallic paint. I think he looks quite handsome! And because of our pool in the backyard, we always have tons of real frogs. So, now they have a proper prince! I’ll be thinking of a royal sounding name for him. And every prince needs a crown. He borrowed it from HRH Bunny. I also started on another project today using the gold paint as well. Recently I found a cute little children’s magnetic board for $4. I really bought it for the letters and numbers so I’m not sure what to do with the original board. My plan is to spray paint the letters and numbers gold and put them on a homemade magnetic chalk board. When I bought the set I wasn’t sure if all of the letters and numbers were intact, but after a quick inventory, they all are present! Perfect! I bought this gold frame at an antique store a few weeks ago. It’s real wood and was only $12. So, I”m making a magnetic chalkboard out of it. I was originally going to make it just a chalkboard, but I figured while I’m at it, it may as well be magnetic too! I love the pretty carved detail in the frame. It has a few little chipped places so I’ll just touch it up with a bit of gold leaf. So, I measured the inside edges of the frame and it’s a standard 16″ X 20″ opening. I cut a piece of 1/4 inch plywood to size using the jigsaw. (one of the few power tools my husband doesn’t mind me using alone.) I sanded the edges with a palm sander until it fit snuggly inside the frame. I painted the front of the board with a thick coat of magnetic paint. It’s a Rust-Oleum primer product. Once that dries I can follow it with a coat or two of the black chalk board paint and pop it into the gold frame. Then it will be a magnetic chalkboard! Double duty! Meanwhile, I spray painted the letters and numbers gold. I can’t wait to put it all together! I think it will be so fun to hang and use it to write messages etc. I think I need more letters in order to spell certain words but it’s a fun start. I’ll check eBay and see what I come up with. 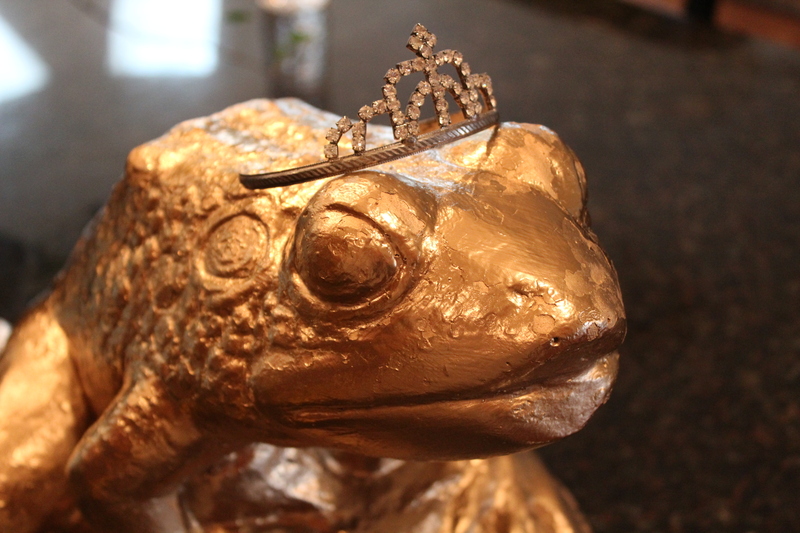 Meanwhile, my frog is dry and looking quite regal with his fresh new “coat”. For now it’s probably a good thing I ran out of the gold paint. Otherwise nothing would have been safe today! Hopefully my magnetic chalkboard will be dry and ready to assemble by tomorrow. Stop back by and see how it turns out! Also on deck is the final master bathroom reveal. I am waiting on one drawer pull and then it will FINALLY be complete! Hope you have a wonderful afternoon and evening! I appreciate you stopping by! xoxo Dell & the Frog Prince.